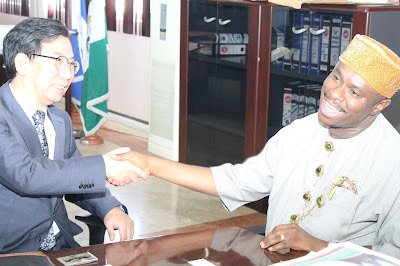 Peterside disclosed this while receiving the Korean Consul General to Nigeria,, Mr Lee Younghoan, who paid him a courtesy visit at the Agency’s headquarters in Lagos. While recognising the strategic position of Korea as a great ship building nation, he appealed to the Consul General on the need for qualified Nigerian seafarers to be placed onboard Korean vessels operating in the Nigerian maritime domain. He told the visiting Korean Consul general that Nigeria has a pool of qualified seafarers and other competent maritime personnel that can adequately serve the global maritime industry. He also restated NIMASA’s commitment to tackling the daunting menace of piracy and related forms of criminal activities at sea. “Nigeria is poised to tackle the menace of piracy and we have recorded great successes in the past three months and our vision is to have safe and secure oceans with zero piracy activities in the next one year”, the DG stated. Earlier in his address, the Consul General commended the NIMASA for its efforts in fighting piracy activities on the nation’s waterways and appealed for more surveillance and security in safeguarding lives and property on the nation’s waterways. He assured the DG of the readiness of the Korean Government to support Nigeria especially in the areas of safety and security. It will be recalled that the DG had at a recent forum, expressed the Agency’s desire to work with other stakeholders to expedite action on the passage of the Anti-Piracy and Other related Crimes at Sea into law. It is hoped that the effort would provide the requisite framework for the fight, prosecution and punishment of piracy and related maritime crimes.